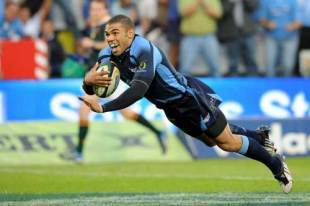 Springboks winger Bryan Habana has accepted an offer to join Western Province and the Stormers from next year. The 26-year-old Rugby World Cup winner is set to make the switch to Cape Town from the Pretoria-based Blue Bulls on a two-year deal. "Some details of the contract still have to be sorted out, but Bryan has decided that Cape Town is where it is at," the player's father, Bernie Habana, told Rugby365. "Those details will be sorted out in the next few days [before he departs with the Boks for Australasia on Tuesday]." The 2007 International Rugby Board Player of the Year turned down an offer to remain with the Blue Bulls who, despite speculation of a possible move to France's Top 14, were the only other side to make a formal offer to the player. England Women completed their Nations Cup campaign with a 100 per cent record after an impressive 22-0 victory over Canada at Fletchers Field in Toronto. England's victory over the hosts followed equally emphatic wins over the USA, France and South Africa. The USA finished second in the table after the ended their campaign with a 15-15 draw with France who finished third. Canada were fourth and South Africa fifth. England now face three back-to-back Tests against World champions in November ahead of their defence of the RBS Six Nations title in the New Year.